Changes to video drivers are always done while offline. Plus recall that I'm on a dial-up connection, so downloading of any video drivers (in the background) would take HOURS since the drivers are usually around 200 ~ 300 MB in size. 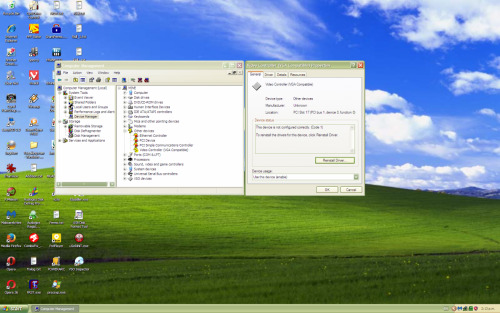 Therefore, it seems Windows XP uses some "interim" system driver until the "official" video drivers are installed. But if so, and since there doesn't seem to be any option for disabling, uninstalling, or deleting the system video drivers(? ), wouldn't there be a conflict between the interim system drivers and the official drivers (when official drivers have been installed)? With the AMD official video drivers uninstalled, the interim system drivers seem to be working as I can change video resolution to the highest settings. But note that there is now no entry for a Display Adapter under Device Manager. Note also there seems to be no driver either for the "Video Controller" entry which appears when there is no Display Adapter. And yet I can still adjust video resolution settings!? Deleted the registry entry for the above (%SystemRoot%\inf), rebooted, but no change! So the registry entry was reinstated. The only other thing I can suggest is to get Process Monitor, It used to work on XP. Don't know if it still does. Unfortunately the logs are too big for the forum and combing through them is very tedious. Save it to your desktop. Run Process Monitor. under Options, click Enable Boot Logging. Close Process Monitor and reboot. Open Process Monitor and it should tell you it has a boot log for you to look at. Process Monitor is installed and still runs under Windows XP. A large 168 MB log file was generated by PM after rebooting, and I was starting to look through it. But noticed that my front USB ports didn't seem to be working 100%. They recognize devices attached but the attached devices could not be run!? In the end I wound up reformatting and reinstalling XP! Now the front USB ports are working OK. Also, Safe Mode booting via msconfig now works again! Finally! However, there is another problem! Shutting down and cold starting the computer works OK, but whenever rebooting/restarting, the monitor shows "no signal" and the computer seems to hang. Unfortunately this happens also to the other operating systems installed (W7 32bit, W7 64bit)! So this suggests a hardware issue (video card, PSU, motherboard?). Switching the PSU off, and then on again after a brief wait allows the computer to boot up and run fine. Changed video cards, but still having issues. Possibly poor PCIe connection (video card not seated properly?). Could it be something in the BIOS? Might try setting the BIOS to defaults. see if it finds anything. But seem to be going from bad to worse now! I have (or had) three working computers. Main one (triple booting) which is the one I'm currently having problems with. Backup computer running XP, but continuously reboots after a few minutes; probable PSU fault, and I can't use this computer at the moment. Emergency computer also running XP, and is the one I'm using at this moment. On my main computer, I cleared CMOS. Removed video card. Set in BIOS "onboard" graphics as primary video source. So now running computer via integrated graphics. Problem now is that as soon as any of the three OS's starts to load, the system blue screens and computer restarts, every time!? Had problem in the past with the video card perhaps not being seated properly(?) which caused issues similar to this. By jiggling and reseating the video card, I managed to get the system running normally back then. I'll try a discrete video card again a bit later and see what happens. Why the BSOD with the integrated graphics?? I've seen the recommendation on the GeForce site to remove the video cards and clean their contacts with a new pencil eraser. You might try that. Expect the BSOD is because it's still trying to use the installed driver for the removed card. Did you disable the driver first? When scanning is done, go Edit, Select All. Go File, Save Selected Items, and save the report as BSOD.txt. I'm typing this on my main computer again! And it is running fine, so far! Yes, I've read about that pencil eraser "trick". But if the video card contacts were dirty to begin with, then the video card would not have worked (properly) to begin with(?). In this case, the video card worked OK from the start but seemed to play up after being used for quite some time (months). I did look at the video card contacts fairly closely anyway, and there were no signs of any contacts being "dirty". It is suspected that the video card worked loose a little from heating/cooling cycles of the computer. Apparently this does occur in some situations where cards do "work loose" after awhile, especially for large heavy cards such as this video card. I have BlueScreenView already installed. The last system crash dump is dated 30 June. There is no record of system crashes that occurred yesterday. Anyway, I believe I've figured out what caused the crashes. When clearing CMOS (resetting BIOS to default settings), that reset SATA drive mode to AHCI, which is not supported by Windows XP. Because I have XP installed, the SATA drive mode has to be IDE mode. And the other operating systems (Windows 7 in this case) have to be installed while the SATA drives are set to IDE mode also. I set the SATA drive mode back to IDE in BIOS, and now all of the operating systems load up fine again! No more system crashes, so far. Edited by brispuss, 10 August 2017 - 03:05 PM. Thanks for the assistance (so far)! Had some problem yesterday while running W7 x64, and later W7 x86. The monitor switched off with the message "No Signal"!? These occurred while just browsing the internet and/or while browsing through system files. So the system (and video) were not being driven hard. Checked video card temperature and its fan speed, both were OK. No apparent over heating issues. Removed video card and stripped it down (removed its fan and associated hardware). There was a bit of dust/dirt on the fan and on the heatsink but not enough to cause impediment to airflow (no over heating should occur). Cleaned both items anyway. But also noticed some dust/dirt tracks on the video card circuit board. Suspecting that this might lead to "short circuiting" of (some) components, I cleaned the dust/dirt off using an air brush (I don't have a can of compressed air to use as a cleaner). Reassembled and re-installed the video card, and so far there have not been any further issues. Ran SFC and CHKDSK, but nothing was found (on W7 x86 anyway). Hopefully that will make it happy.